What Are the Benefits of Peanut Butter With Palm Oil? You can eat peanut butter on sandwiches, with vegetables, with crackers or even on your breakfast cereal. Peanut butter is a popular and nutritious blend of peanuts and oils, and some brands also contain sugar or salt. Peanut butter with palm oil may have benefits when you eat it in moderation with other healthy foods. Peanut butter with palm oil is high in unsaturated fats, with 7.6 grams of monounsaturated fat and 4.4 grams of polyunsaturated fat in a 2-tablespoon serving. You may be able to lower your cholesterol levels when you choose unsaturated fat instead of saturated fat, according to the 2010 Dietary Guidelines from the U.S. Department of Health and Human Services. Palm oil contributes saturated fats, but peanut butter with palm oil is a healthier choice than peanut butter made with partially hydrogenated oils. Partially hydrogenated oils contain trans fat, which raises your cholesterol levels more than saturated fat. A 2-tablespoon serving of peanut butter provides 1.9 grams of dietary fiber. Dietary fiber lowers your cholesterol levels and helps prevent constipation, according to the 2010 Dietary Guidelines from the U.S. Department of Health and Human Services. Healthy adults on a 2,000-calorie diet should get at least 28 grams of fiber per day, but the average American gets about 40 percent of this amount. 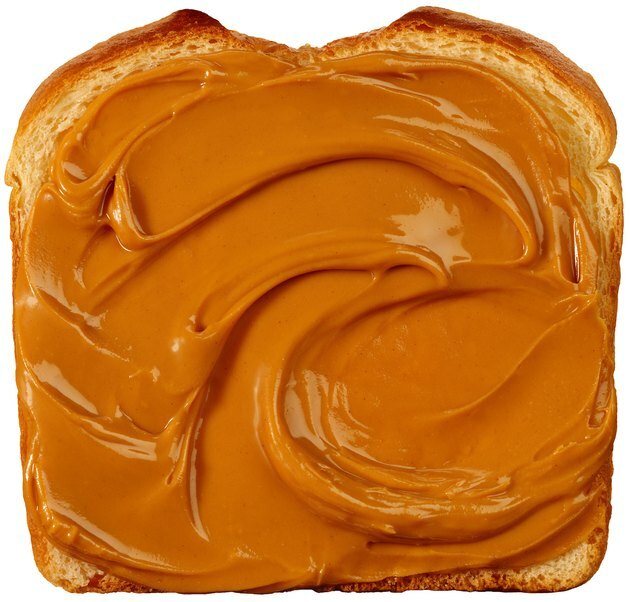 Palm oil in the peanut butter does not affect the fiber content. Although peanuts are technically legumes, their nutritional profile is closer to that of nuts, such as almonds, pecans, pistachios and macadamias, according to the Linus Pauling Institute Micronutrient Information Center. Peanut butter with palm oil is a good source of magnesium, which is an essential mineral for proper muscle function. The peanut butter also provides vitamin E, an anti-oxidant, and niacin, or vitamin B-3. Peanut butter without salt has 5 milligrams of sodium per 2-tablespoon serving, and peanut butter with salt has 147 milligrams. Individuals who regularly eat nuts and peanuts tend to have lower body weights than individuals who avoid them, according to the Linus Pauling Institute Micronutrient Information Center. You may be able to eat less when you include peanut butter with palm oil in your diet because a 2-tablespoon serving has 8 grams of protein, which is a satisfying nutrient. To avoid gaining weight, eat peanut butter only in moderation, since it has 188 calories per serving. Are Peanuts Healthy for Your Heart?